Thomas R. Van Devender, Karen Krebbs, and Ana L. Reina G.
El Aguajito is a very well known birding locality near Yécora in the Sierra Madre Occidental of eastern Sonora, Mexico. It is located in Barranca Honda (28°22'18"N 109°02'54"W; 1640 m elevation) 19 km west of Yécora on MEX 16. This steep, shady canyon drains the north slope of Mesa del Campanero. The name El Aguajito refers to a seep on a roadside cliff where passing travelers replenish their drinking water. 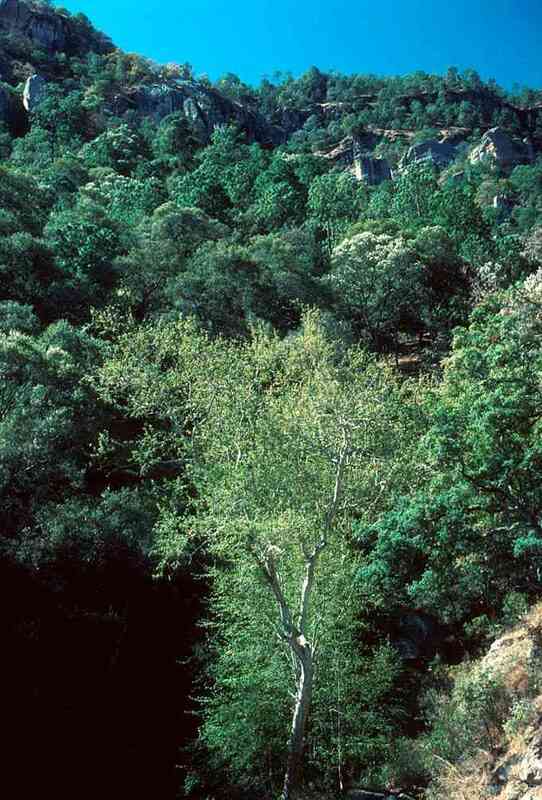 The barranca (deep canyon) supports a rich riparian forest with sycamore (Platanus racemosa) and Madrean holly (Ilex tolucana), and relictual populations of white alder (Clethra mexicana) and pino chino (Pinus maximinoi). Pine-oak forest with Yécora/pino colorado (P. yecorensis), cusi prieto (Quercus hypoleucoides), encino roble (Q. rugosa), and others grow on the steep slopes. A total of 161 plant collections by Arizona-Sonora Desert Museum botanists from 1988 to 2003 reflect a rich, diverse local flora. 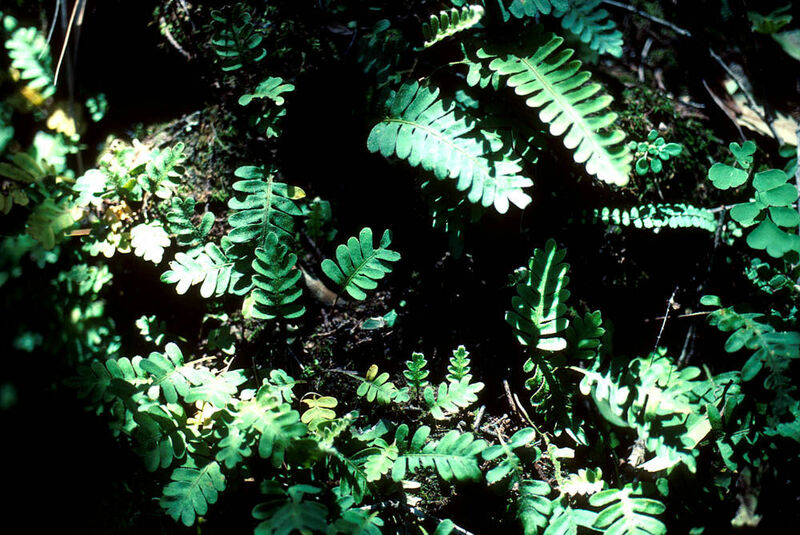 Ferns are especially common in the canyon with 13 species, eight of them rare in Sonora. Fern banks covered with maidenhair fern (Adiantum poiretii) and mossy boulders covered with polypody (Polypodium polypodioides, image below) are found in shady areas. A clump of the primitive whisk fern (Psilotum nudum) is on a cliff wall. 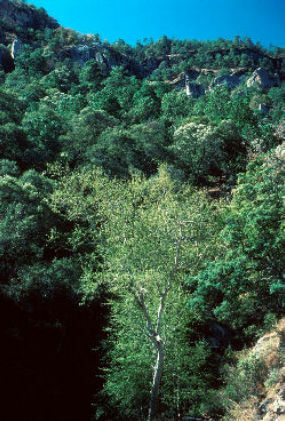 The white alder occurs from Central America northwest to Durango and Sonora. Interestingly, Clethra was reported from the middle Miocene (17 mya) Tehachapi flora on the westernmost edge of the Mohave Desert in California (Axelrod 1979, 1983) about 1140 northwest of Yécora. The genus Clethra in the Clethraceae contains 6-7 species of trees found in montane forests of Central America and Mexico (Standley 1924). The El Aguajito population of C. mexicana is the northernmost stand discovered to date. 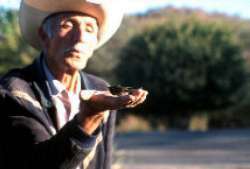 El Aguajito supports one of the most diverse bird faunas in Sonora in an area of only 0.5 sq. km, and is well known by birders. A few years ago, the Yécora Christmas Bird Count (CBC) had the greatest number of species of all Mexican CBC's. Interesting birds observed in the area include Aztec thrush (Ridgwayia pinicola), blue mockingbird (Melanotis caerulescens), rufus-backed robin (Turdus rufopalliatus), rufus-capped warbler (Basileuterus rufifrons), and slate-throated redstart (Myioborus miniatus). Thick-billed parrots, locally called guacamaya (Rhynchopsitta pachyrhyncha), until recently visited Mesa del Campanero in November to eat piñon (southwestern white pine, P. strobiformis) seeds. Military macaw (Ara militaris), locally called guaco, occurs from El Aguajito down into the tropical canyons below. Ten species of hummingbirds were seen in the El Aguajito area. A dense stand of pineapple sage (Salvia elegans) is an important nectar patch for resident berylline (Amazilia beryllina) and white-eared (Hylocharis leucotis) hummingbirds while exotic tree tobacco (Nicotiana glauca) attracts blue-throated (Lampornis clemenciae) and violet-crowned (Amazilia violiceps) hummingbirds. Female beryllines observed building nests twice in late August were the first evidence of the species breeding in Sonora. Black-chinned (Archilochus alexandri) and rufous (Selasphorus rufus) hummingbirds use El Aguajito in their southward summer migrations. El Aguajito was a study area for hummingbirds in the Museum’s Migratory Pollinators Project. Karen Krebbs, Bill Calder, Steve and Ruth Russell, Susan Wethington, and other ornithologists visited the area many times during the project. El Aguajito is owned by Rubén Coronado (below) of Rancho La Palmita. The Coronado family was very active in the Migratory Pollinators Project. 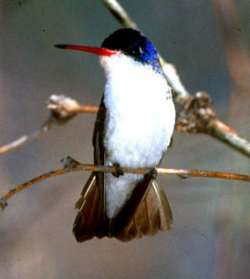 Many hummingbirds were observed and banded at the feeders at their home, now called Restaurant La Palmita. They have a few rooms to rent. This rich pine-oak forest habitat is in urgent need of protection. Axelrod, D. I. 1979. Age and origin of the Sonoran Desert. California Academy of Sciences Occasional Paper 132:1-74. _____. 1983. Paleobotanical history of the western desert. Pp. 113-129 in S. G. Wells and D. R. Haragan (eds. ), Origin and Evolution of Deserts. University of New Mexico Press, Albuquerque. Standley, P. C. 1924. Trees and shrubs of Mexico (Passifloraceae-Scrophulariaceae). Contributions from the United States National Herbarium 23:849-1312.